Peter Chan asked if I would like to take a second shot from the middle of bustling Orchard Road. I gladly took up the challenge. This is a continuation of my second shot of Peranakan Place. Victor's favourite Framroz's Aerated Waters sign has disappeared in this 1960s photo by Terry Goodyer. Today we see Orchard Emerald still retain the old facade. Unfortunately only the facade is left standing when I was there, the building proper has been demolished. Orchard Emerald is slated for joint redevelopment with former Specialists’ Centre / Hotel Phoenix. There are plans for a linkbridge to connect the two. What took over the site of Pavilion Cinema - Specialist Shopping Centre - had been torn down for redevelopment. There are plans for the site to house the new Orchard Library in 2013. 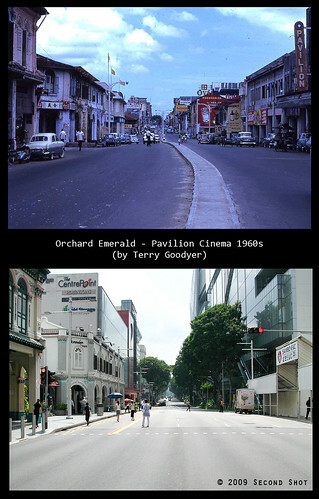 Orchard Road was a dual carriageway in the 1960s. It only became a single carriageway in 1974 with the introduction of the Orchard Road-Orchard Boulevard pair scheme. Specialist Centre was completed around that time. I like the gentle arc of the road on the side of Pavilion Cinema which is still visible in today's photo. With the road divider gone, you may not realize the slight bend of Orchard Road at this stretch. Previously I thought our shopping belt is one straight road. Notice in the background there is a depression. I believe Orchard Road has its lowest elevation at Koek Road. Few nights ago, on the bus from Palais Renaissance to Dhoby Ghaut, I looked out at Centrepoint and realized the bus was on a downslope. Now I remember the pedestrian sidewalk outside OG Orchard and Orchard Central are raised above road level. The green man only runs for 20 seconds at the Orchard Emerald traffic light. I have to run to the middle, position, snap and run back .... in 20 seconds. To get as much of the old photo in as possible, I have to stand way back, at the vehicle stopping point. There are still pedestrians (including jaywalkers) yet to cross the road in the last few seconds. This was actually my second attempt. I undertook the mission alone many weeks ago but the result was unsatisfactory. I realized there is no way to sprint to the middle and take the shot without pedestrains crossing a quarter of the road and marring the shot. So I have to bank on the last few seconds. There is, however, this lingering fear that I won't be able to run back in time, before the vehicles start hooting. hello eveline, it was in the morning, 10+ on a sunday. 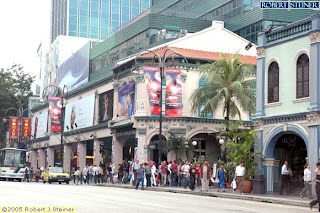 Orchard Road was 2-way street from what is now Doby Gaut Station (facing Citibank building) and all the way to Tanglin Road, Orange Grove Road with orchard Road. I think up to 1975. Next task probably high up in tall buildings? also done. there was one taken from Hotel Phoenix I think. I have tried to reproduce it for "from cold storage to centrepoint". your bag is heavy u know. Adelin .. for carrying such a heavy bag, you deserve a big round of applause. Hi Icemoon, if there was an older "third" shot added to your current photos, we might be able to see the old railway bridge ahead on the same road which lead to the old Tank Road station. Anon, you are right, but I can't find such a shot (of the bridge taken from Emerald Hill side). The national archive has a book which contain this photo. But it was shot in the opposite direction. I could see the old Cold Storage supermarket in the background. Based on your photo, the bridge should be so near your location that you could throw a stone at it. Hi Auleo, you are from KL?? 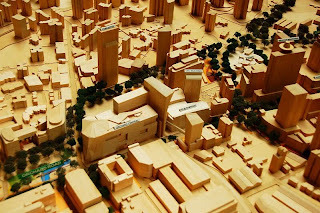 I like the place, have blogged and will blog more about KL.